And my mother, a beauty in her own right, followed suit when she got to be a woman of a certain age. But now that I’m that woman of a certain age, I’ve come to realize that it’s not vanity, really, but rather, it’s taking pride in the way we look. It’s even more than that. It’s the desire to look as youthful on the outside as we feel on the inside”full of vigor, energy and life. I’m hardly alone in my feelings; otherwise, why would there be a record $12 billionÂ spent in 2013 on surgical and nonsurgical cosmetic procedures, as reported by the American Society for Aesthetic Plastic Surgery? Of that, $5 billion was spent on nonsurgical procedures, like Botox and facial fillers. Curious, I recently met with board-certified plastic surgeon David Shafer, MD, who has a thriving surgical and injectable practice in midtown Manhattan to get his take on the subject. He gave me the inside scoop on Botox Cosmetic, Juvederm and Juvederm Volunma XC. Botox is the first FDA-approved treatment to soften dynamic lines and wrinkles of the glabella”that’s the area between the eyebrows that can sometimes cause you to look angry or distressed (when you’re not even close to feeling that way). Botox Cosmetic is also the only neuromodulator approved to treat crow’s feet”and I think we all know what those are. Some like to call them “laugh lines,” but you can get them from more things than laughing (like repeated squinting or frowning). Effects with this quick 10-minute procedure with no downtime can last most people anywhere between three to five months. The results appear gradually over a few days, softening the dynamic wrinkles around the eyes. You’ll see gradual results about three to five days after the injection, and there are no restrictions after the treatment except for a rather obvious one: Don’t go for a face-down massage immediately after the treatment. After several hours, the product is well incorporated. Many people sneak in a treatment on their lunch hour or on their way home from work, with no disruption to their activities. While some might feel nervous about the name “toxin,” Dr. Shafer explained that the amount used for cosmetic treatments is infinitesimally small. “In fact, any medication in large quantities could be ‘toxic,’ so it really is just a matter of semantics,” he explained. The effects are always temporary and leave no lasting effect. Both Juvederm and Juvederm XC are fillers composed of hyaluronic acid that can add volume to your face. Why would you want to add volume? With aging, volume naturally declines, leading to sagging skin and deeper wrinkles. As the midface deflates, the loose skin starts to create folds and creases (such as those nasolabial folds around the mouth and the “marionette lines” and jowls in the lower face). Eek”acid!!?? “This is a technical molecular classification,” Dr. Shafer said. “Rest assured, there is no ‘acid’ effect with these products.” Hyaluronic acid is a natural molecule of the skin, found throughout the entire body. And due to its biocompatibility, the chance of any reaction or allergy is very low, he assured me. Effects can last up to two years. Juvederm is most commonly and successfully used to soften the areas around the mouth and nose, thus giving the face more contour and a subtle “lift” of sorts. “A balance is achieved between adding enough volume to smooth the wrinkles, while not adding too much to look unnatural,” explained Dr. Shafer. The focus is to address the 3-D structure of the face; it’s not just about smoothing a wrinkle or filling volume. Because Botox uses the smallest needle available, and Juvederm uses the second smallest, “Most patients do not require any topical anesthetic. However, I offer this if they want it. 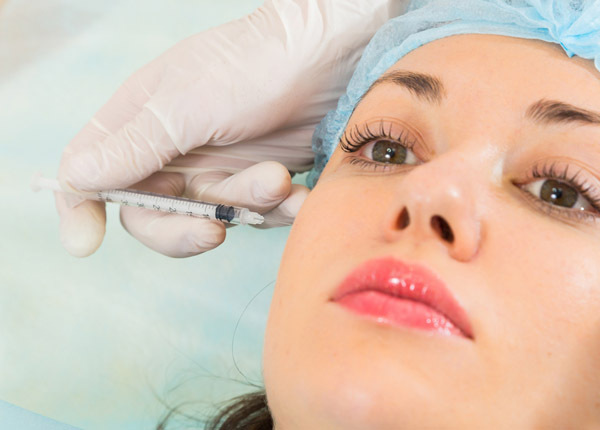 An alternative is placing some ice on the area of injection immediately prior to injection.” Even better, Juvederm XC products have lidocaine added to them; this locally acting anesthetic begins to work immediately upon injection. I can vouch for this: It’s surprisingly UN-painful! Yes, like the generations of women before me, I like my looks to reflect my inner zest. Now you know my secret (but not all my secrets). But in all fairness, I will be honest and say no, I was not away on vacation. And cosmetic treatments aside, there is a lot of truth about living a totally healthy lifestyle for the whole look-good, feel-good package: “Patients also need to eat healthy, stay well-rested and well-hydrated, not smoke and have a good daily skin-care regimen,” said Dr. Shafer. I couldn’t agree more. And if my grandmother were alive today, she’d be nodding her head right along with me”but keeping it still while the doctor worked his magic with the incredible tools available today, like Botox and Juvederm.